I had such a great weekend, I can't remember when I had so much fun crammed into only a few days. I kicked things off with a 'girls night out' on Friday with my amazing mother, hung out with my bff who was up visiting me from Miami, then spent time in Cambridge shopping at Paper Source, browsing Nomad (great ethnic textiles here) and Abodeon (awesome vintage mid century finds), then hit Greenward, a brand spankin' new must-see store for products with a conscience. When you're in need of beautiful planet-friendly homewares, books, magazines, jewelry, baby gear, bike accessories, and stationery, shop Greenward because this place has a great selection and is in a great little hood. I mean, with Starbucks and other random cafes sprinkled around, tons of great ethnic eateries, Paper Source, Nomad, Abodeon, and other boutiques all within a few blocks, you can easily take the T over to Porter Square and do a little Mass Ave. shopping for a few hours. 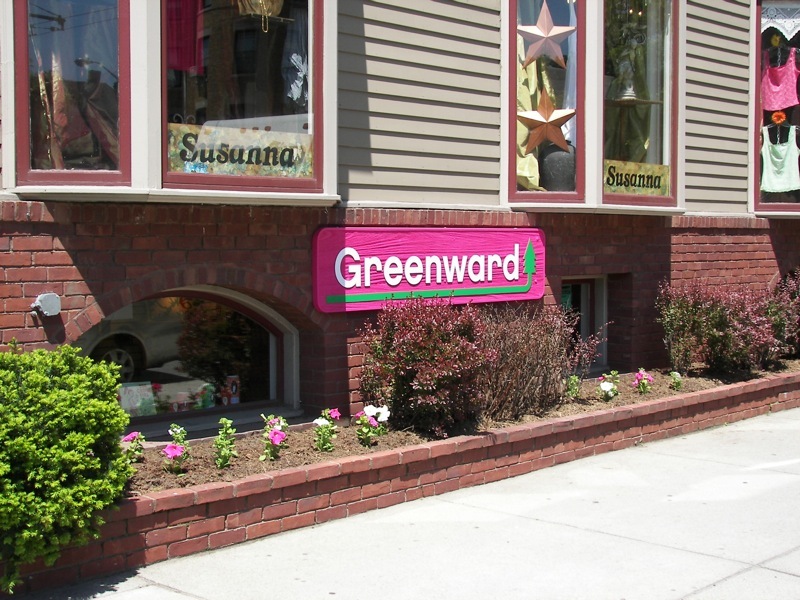 Greenward is located at 1776 Mass Ave., so it's only a 5 minute walk. I was impressed to find Greenward for several reasons, the first of course being the cause, shopping eco when I can is important to me. But also the selection is great. It's not crunchy and boring, which is sometimes what you think of when you picture eco-friendly finds. 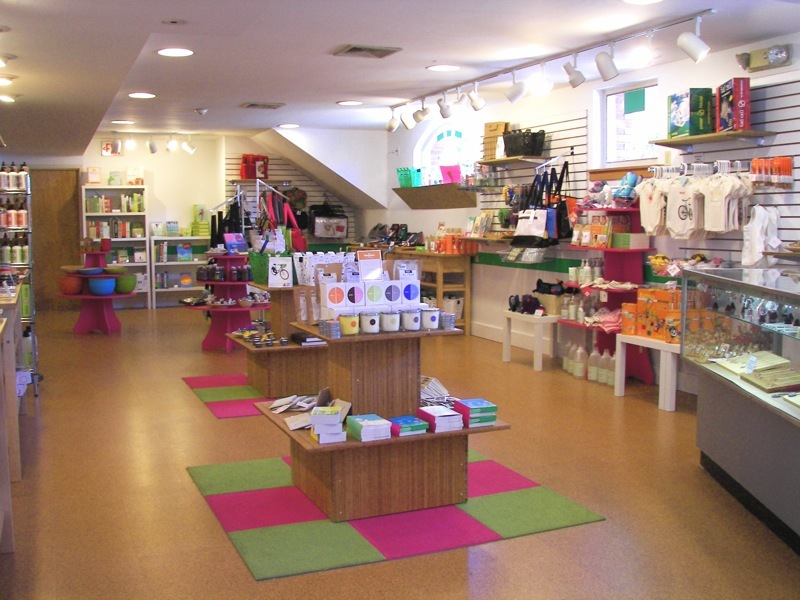 With Jill Bliss, Little Otsu, Good on Paper, Josh Jakus, Pear Tree Studio, K Studio, and Pangea Organics on the list (to name a few), this shop carries the best of modern green goods that are currently on the market. They even have those great bike baskets in green and white that have been all over the blogosphere lately (Joy wrote about her basket here). In addition to the great products, the location can't be beat. Don't let the below street level location fool you, it's not dark, depressing, or hard to find. Quite the opposite. Owners Scott Walker and Simone Alpen (soon to be husband + wife, if her name sounds familiar, she's the brains behind The Bazaar Bizarre) did a fantastic job with their bright signage and in the overall design of the space. With tons of natural light flooding in and cheery colors dotted all around the store, you can only guess that a lot of planning went into this store. 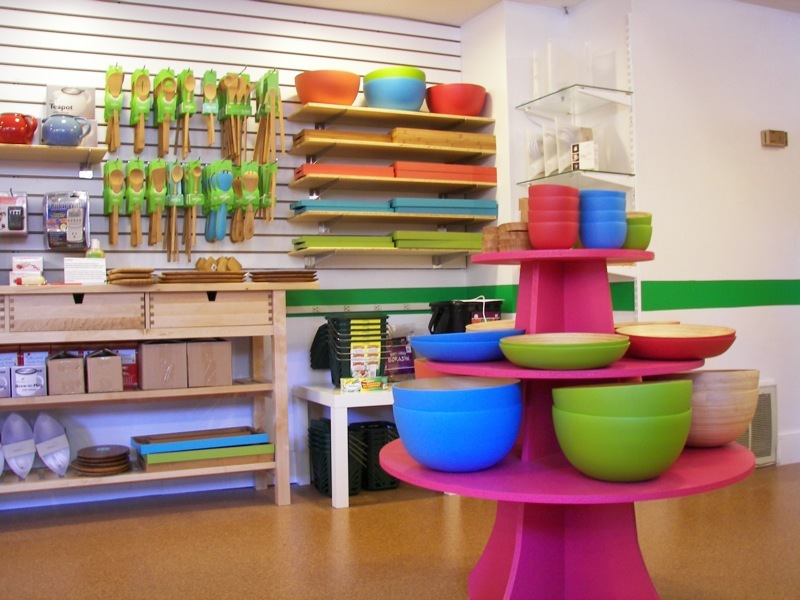 The moment you find out that the displays are all hand built using eco-responsible woods, the flooring is cork, overhead lighting is energy-efficient compact fluorescent bulbs, and the walls were painted using low-VOC paint, your suspicions are confirmed. The energy in this store is just great, almost like you've left Boston for a few moments and entered sunny California. When you walk in, you're not only greeted with great products, but also with a friendly smile, the smell of a delicious soy-based candle burning, and great tunes (music is a huge plus for me) piped through "green" speakers constructed of oak reclaimed from whiskey barrels. 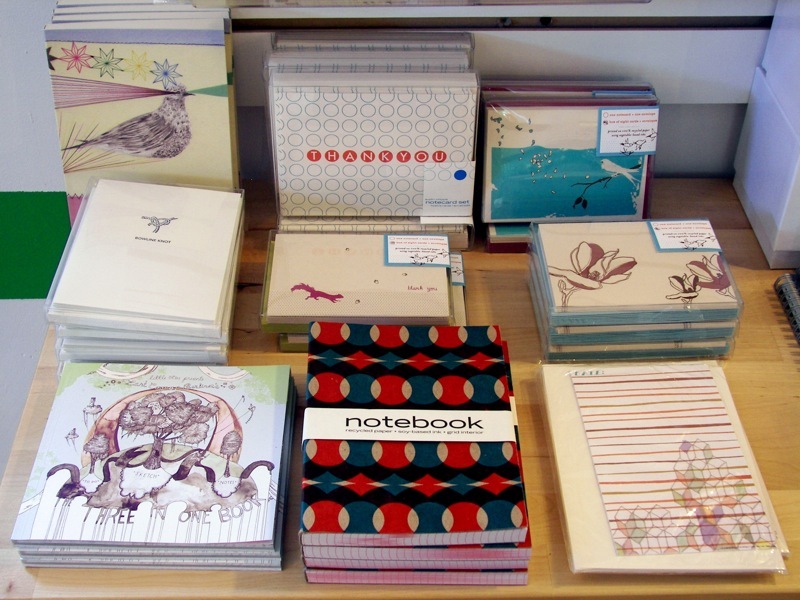 Take a complete tour of their space here (lots of product shots). 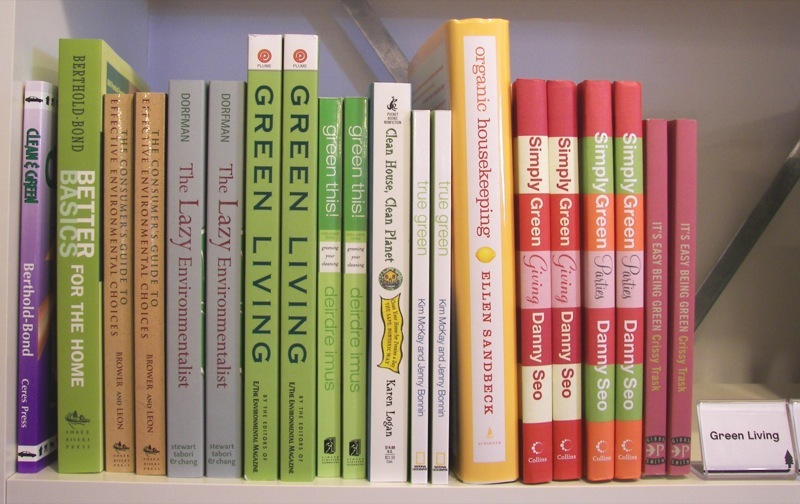 Or if you're local, go check out the store and see this great green store for yourself. A huge thanks to Scott for sending these over to me. Hi Simone! !